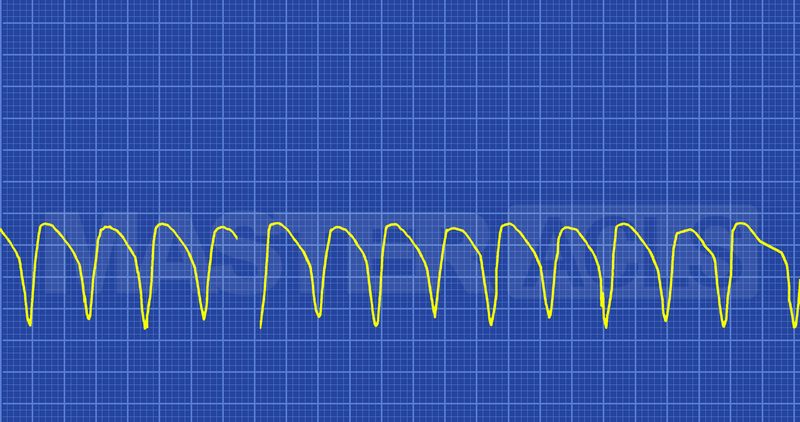 For detailed information on this rhythm click on ECG for Everyone to watch a video on how to easily identify all ACLS arrhythmias and how to use the ACLS algorithms to treat them. Wide complex tachycardia may be monomorphic (one-shaped) or polymorphic (many-shaped). 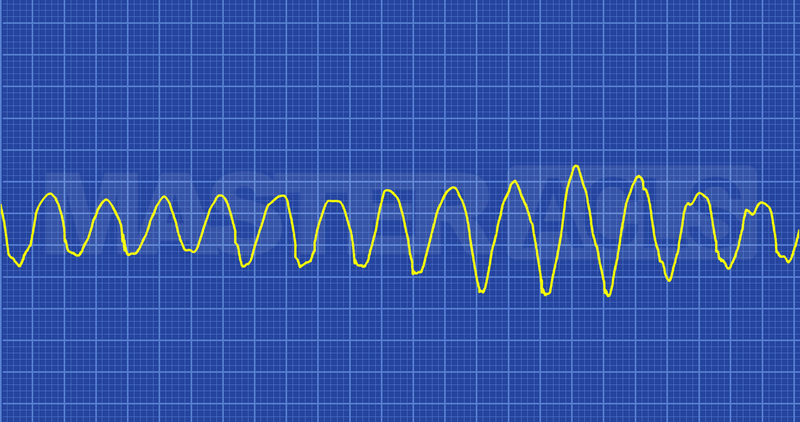 These rhythms may or may not be stable based on the symptoms presented by the patients. Wide complex tachycardias are defined as having a QRS complex of ≥ 0.12 second. Since these tachycardias as the most common rhythms to deteriorate into VF, expert consultation should always be considered. Some experts define Ventricular Tachycardia as any rhythm that has the following characteristics. Since each ventricular impulse is being generated from the same place in the ventricles all of the QRS complexes look the same (symmetrical). What treatment to employ depends on if the patient is stable or unstable. Underlying conditions should always be considered and treated if possible. However, if the patient is unstable treatment of underlying conditions should not delay the implementation of the ACLS Tachycardia algorithm. Synchronized cardioversion at 100 Joules is the immediate treatment for unstable monomorphic VT with a pulse. Patients without a pulse should have CPR started and be defibrillated as soon as possible. Follow the ACLS Cardiac Arrest Algorithm for treatment guidelines. The QRS complexes are not symmetrical in polymorphic VT because each electrical impulse may be generated from a different location in the ventricles. On the ECG strip the impulses may appear wider and taller than in monomorphic VT. One of the most frequently seen polymorphic VTs is Torsades de Pointes. In this arrhythmia the tips of the QRS complex appear to go up and down creating a rolling pattern. This arrhythmia is often seen as a result of hypomagnesemia. There are other polymorphic arrhythmia patterns that may require expert consultation to identify and treat. If the patient is stable, treat the patient’s symptoms and identify and treat the underlying causes if possible. Members can watch a video that identifies these at Underlying Causes of Cardiac Arrest H’s and T’s. Unstable polymorphic VT with a pulse can not be treated with synchronized cardioversion because of the irregular pattern of the QRS complexes there is nothing regular to which defibrillator can synchronize delivery of the shock. Patients without a pulse should have CPR started and be defibrillated as soon as possible. Follow the ACLS Cardiac Arrest Algorithm for treatment guidelines.